Get Summer's Best Recipes from Artisan Wineries! For 24 years The California Wine Club has been exploring the dusty back roads of California's wine country, seeking out award-winning, limited-production wines from artisan wineries. They then share their best discoveries with club members across the United States. Along the way, these small family wineries have shared their time-honored family recipes. Each season, The California Wine Club shares a new collection of recipes through their publication "Winemaker's Kitchen." The summer issue is now available. Have I ever mentioned how much I enjoy discovering the vast variety of grapes and wines? Yeah, I thought I had. I was one of the first members of the Wine Century Club, and I'm a big promoter of Century Club founders Steve and Deborah De Long's lovable Wine Grape Varietal Table. Even after building my "life list" of varieties tasted up to several multiples of the Century - I lost count somewhere after 400 or so - I'm still almost certain to grab a bottle without asking too many questions if I spot a variety that I haven't tried. This attitude was well rewarded the other night when I noticed a lone bottle of Maison Legrand 2012 Côtes de Gascogne Gros Manseng. At 10 bucks or so, it was an easy choice, and when I got it home and gently chilled, I was mighty glad that I had taken the risk. Light and fresh, with fresh-fruit aromas of apple and pear followed by textured, aromatic peach and mango flavors; crisp acidity and light 12% alcohol made it a good choice as an aperitif or table partner with spicy ethnic cuisine. Gros Manseng thrives in Southwestern France - this one came from Gascogne (Gascony, the home of Three Musketeers hero D''Artagnan.) To pronounce it, say "Grow Mon-song" in American English and you'll be close enough for folk music. Add a little French gargle to the "r" and a nasal "n" to end both syllables of "Manseng" and you'll sound as French as Maurice Chevalier. Or maybe not. "Gros" means "large," and apparently this light-skinned grape gets this name for its large size and thick skin. It's often used in blends, typically with its sibling Petit Manseng or Sauvignon Blanc, but this single-varietal model is mighty persuasive. Some experts liken it to Viognier, but I'm not seeing it in this model. Your mileage may vary, and if so, I hope you'll let me know what you think, in a comment on the WineLovers Discussion Group or our recently updated WineLovers Facebook Page. A number of years ago, when the adult world was first discovering Facebook, I created a Page for WineLoversPage. Then I couldn't figure out what to do with it, so I left it unused, choosing instead to use my personal Facebook to connect with all my friends in all my various circles of life in one central place. Recently, however, I decided to tune up the old WineLovers Facebook, just to see what would happen. Now you can use it as another place to keep up with The 30 Second Wine Advisor as well as checking in on occasional wine news and active topics on the WineLovers Discussion group. If you use Facebook, You're invited to drop by. I'd appreciate it if you will "Like" the Page, and feel free to comment on any of the topics you find there. See you online! "We talk regularly about Champagne and how it can define a moment, or even create one, but the same applies to most any sparkling wine," Richard Fadeley writes in his WebWineMan column. He asks, "why not look at the 'second stringers' of sparkling wine? They are not too shabby in their own right." Here's his report. Get Summer's Best Recipes Straight from Artisan Wineries! Along the way, these small family wineries have shared their time-honored family recipes. Each season, The California Wine Club shares a new collection of recipes through their publication "Winemaker's Kitchen." The summer issue is now available. FOOD MATCH: Fine as a summer aperitif, its fresh aromatics and light alcohol also suggested an affinity for spicy ethnic fare, and indeed, it was very good with a stir-fry of fresh garden green beans, just-picked San Marzano tomato, onions, ginger and garlic with firm tofu and Sichuan-style spice. VALUE: For a penny under $10 in today's market, it's a no-brainer. Load up. 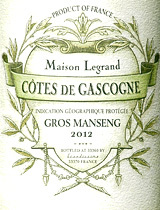 Unfortunately, Wine-Searcher.com lists only a single U.S. vendor for Maison Legrand Gascogne Gros Manseng. However, try this Wine-Searcher link for Gros Manseng from many other producers. Or, try this link to contact importer Cutting Edge Selections.